It is common for pop culture favorites, e.g., Bill Maher  and Jon Stewart , to ridicule religion and argue that it is a natural enemy to science. It helps that their audiences are probably as disinterested in science as they are in religion. Whenever people of faith can be portrayed as opposing a position taken by any atheist professor at any university, the bat signal is beamed to crank up the late-night joke factory, which feeds the next day’s video clips. However, the premise underlying many of those type jokes rarely get a second or longer look. Enter John Lennox, a mathematician and Christian, who provides a great example in how to defend the faith in the video of his talk at the Socrates in the City forum. It was based on one of his books, Seven Days That Divide the World. In it he reminds us why science should be about always asking questions, not taking dogmatic positions. Mr Lennox is all about big subjects, fitting for someone who actually had C.S. Lewis as a lecturer. For example, how surprised do you think a typical Maher or Stewart viewer would be to learn that the science community had completely flipped its position regarding the origins of the universe in their lifetimes? Georges Lemaître, a Belgian astronomer and professor of physics is credited with first proposing the theory of an expanding universe in 1927. However, the accidental discovery of background radiation in the 1960’s is when a significant shift began taking hold and by the late 1990’s, the latest science orthodoxy was established, the big bang theory. How different are today’s atheistic scientists from those? Parallel universes anyone? Eric Metaxas is amazed at the unbelief. 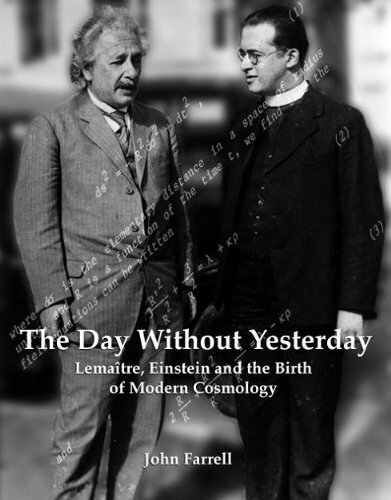 By the way, that pioneering Belgian physicist in the 1920’s, Georges Lemaître, had a day job. He was a Roman Catholic priest. I’m glad Fr. Lemaître didn’t have our extensive media in his day. He would have been such a joke. This entry was posted in Catholic Faith & Inspiration, Science & Technology and tagged C.S. Lewis, Eric Metaxas, Evidence Unseen, Georges Lemaître, John Lennox, Seven Days That Divide the World, Socrates in the City. Bookmark the permalink.